During its entire quarter-century independence period, Kyrgyzstan constantly had to hold challenging negotiations with Uzbekistan on the conditions of supply and delivery of natural gas by the latter. This gas cabbala may soon come to its end: Gazprom’s engineers are completing the blueprints of the North-South gas pipeline that will connect the northern and southern parts of Kyrgyzstan. Tashkent often resorted to unveiled blackmailing during disputes over gas delivery prices. The Uzbek officials have often shut the gas valve closed in the coldest times of year and simply waited for the neighbours to humbly knock on the door, requesting the resumption of gas supply. The gas prices would predictably rise, while Bishkek was given no alternatives. In 2014, Uzbekistan stopped delivering gas in April. The Uzbek party refused to even discuss a new contract for several months even though the previous contract expired long time ago. The southern regions of Kyrgyzstan, including the main city of Osh, were left without gas until the end of 2014—until the Uzbek neighbours agreed to resume gas delivery. That said, the Kyrgyz government did not succumb to the deliverer’s demands to pay more and showed character. However, there were no guarantees Bishkek would not experience this situation again in future. Therefore, the news that Kyrgyzstan can potentially obtain independence from its gas delivering neighbour’s capriciousness is a very good one. Gazprom acquired the Kyrgyz gas distribution and delivery system and pipelines after lengthy debates two years ago. The new owner promised to make large investments; the promises are now being partially fulfilled. In addition to maintenance and refurbishment of the existing pipelines, Gazprom sent a big group of engineers to Bishkek and they are completing a feasibility study on construction a completely new branch to connect the south and north of Kyrgyzstan, which will completely eliminate the need in the Uzbek gas deliveries. One of the Gazprom designers told Fergana that there were two projects under consideration initially. The Eastern Line would traverse Chuy Region and would further stretch into the southern region along the Bishkek-Osh motorway; the Western Line would traverse Talass Region and then go in the western direction via Jalal-Abad Region along the Kyrgyz-Uzbek border, reaching into the cities of Jalal-Abad, Uzgen and Osh. The Gazprom designers chose the latter project, which has been proposed to the Kyrgyz government, planning agency and energy ministry for coordination. This particular pipeline will feature 400mm-thick pipes, whose capacity is projected to reach 330.7 million cu.m. of gas by 2030. Of the total length of 608km, 210km will straddle mountainous regions. Specifically, the pipeline will need to be constructed over the Talas and Chatkal mountain passes and four mountain rivers. Doing so will resolve the problem of delivering Gazprom-provided gas to Osh and Jalal-Abad because the planned gas distribution and delivery networks will be independent from those of Uzbekistan. And Kyrgyzstan will no longer need Tashkent as its primary supplier of gas. Interestingly, another pipeline will be constructed alongside the one in question in accordance with an agreement the Kyrgyz government ratified with China back in spring. But this pipeline will only serve as a transit vessel straddling Alay and Chon-Alay districts of Osh Region in southern Kyrgyzstan. This particular pipeline will deliver China-bound transit gas originating in Turkmenistan via Tajikistan. Kyrgyzstan will receive some 2b USD revenue for transit over the life of the pipeline, but will not be able to tap it for its own fuel needs. The cost of doing so would simply be unaffordable for Kyrgyz consumers. On the other hand, Gazprom is offering significantly more competitive prices. It is worth noting that the north-to-south pipeline will be owned and managed by Gazprom Kyrgyzstan LLC, a company registered and pays taxes in Kyrgyzstan. 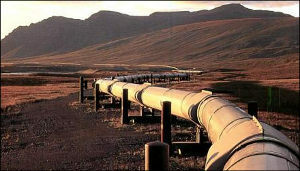 Russia’s Gazprom announced its preparedness to invest in the project. Unfortunately, the Kyrgyz side failed to timely complete tasks on its end—collecting the necessary information and data in involved regions. However, Deputy Prime Minister Tayirbek Sarpashev’s involvement has significantly sped the process up. Against this backdrop, there is only one factor that could block the entire project—the political aspect. After all, the sale of KyrgyzGaz to Gazprom (for a symbolic 1 USD, inclusive of all debts) stirred the opposition factions’ significant resistance in the Jogorku Kenesh [parliament]. Kyrgyz President Almazbek Atambayev had to apply enormous efforts to push the decision through; as we can see, the move appears to be quite warranted. Such resistance may arise again in regards with the new pipeline, since its cost will be rather significant—over a billion US dollars. Obviously, Gazprom is a charity and will strive to cover its expenses using profits from the new pipeline’s use. Therefore, the level of support opposition parties will receive at the October 4 parliamentary elections is extremely important. If they are able form a coalition in the parliament, the likelihood of shelving the Gazprom project is quite high. But if the Social Democratic Party of Kyrgyzstan (SDPT) will be tasked with forming a coalition with amiable political organisations, as has been the case thus far, the project would swiftly clear the Jogorku Kenesh. By the way, the construction is scheduled to take place over three years. When the new MPs will be deliberating a decision on the proposed pipeline, they will need to keep the country’s fuel security in mind at all times. Kyrgyzstan has already taken the first critical step toward decreasing its dependence from unpredictable Uzbekistan, having completed the construction of the Datka-Kemin high-voltage electricity line. Thanks to Datka-Kemin, Kyrgyzstan is able to completely bypass the territory of Uzbekistan while delivering electricity produced in the south to consumers in the northern regions. It is now time to take the next step.